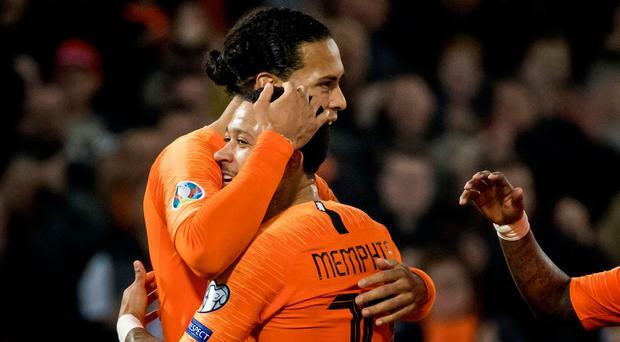 The Netherlands' Virgil van Dijk (L) celebrates with Memphis Depay. The Netherlands got their Euro 2020 qualifying campaign off to a winning start on Thursday evening, smashing Belarus 4-0 in the evening's other game in Northern Ireland's group. While former Manchester United winger Memphis Depay netted twice, Liverpool duo Virgil Van Dijk and Georginio Wijnaldum both got on the score-sheet. Depay opened the scores in the first minute and it was Wijnaldum who blasted home the second after finding space in the box midway through the first half. After a Depay penalty put the game beyond the visitors, Van Dijk bulleted home a close-range header to round off the scoring on 86 minutes. Beaten Belarus are the visitors to face Northern Ireland on Sunday evening (kick-off 7.45pm).